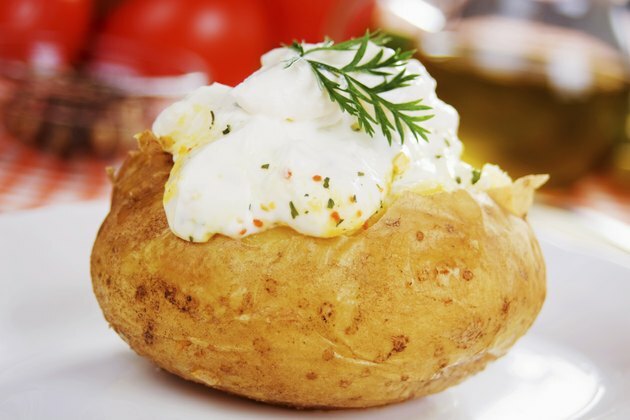 A baked potato makes for a delicious side, but if you opt for too large of a potato or drown it in too much butter and sour cream, you may end up eating enough calories for a whole meal. Keep your potato small and your toppings minimal so you don't go over your calorie allotment for your meal. If you order a 6-ounce potato topped with about 3 tablespoons of sour cream and 1 tablespoon of chives at your favorite restaurant, you'll be consuming around 250 calories. A larger fast-food baked potato with sour cream and chives weighing about 10.5 ounces contains about 393 calories. Add a tablespoon of butter or margarine to either of these baked potatoes and the calorie count increases by 100. You can better control the calories in your baked potato with butter and sour cream if you make it yourself. A small 2.5-inch baked russet potato, which weighs about 5 ounces, contains 134 calories, the same-sized white baked potato contains 130 calories and a small red-skinned potato contains 123 calories. Each tablespoon of reduced-fat sour cream adds 22 calories and each tablespoon of fat-free sour cream adds 9 calories. Fitness Magazine: How Many Calories Are You Really Eating?